In recent weeks, discussions about the GW Hospital's plans to open a new hospital in Southeast D.C. have reached a boiling point. In recent weeks, discussions about the GW Hospital’s plans to open a new hospital in Southeast D.C. have reached a boiling point. The plan has garnered backlash from community leaders, while D.C. Council members have thrown their support behind amended legislation expediting the new facility’s opening. But as of Thursday, GW Hospital halted negotiations with the city to operate the new hospital – and the entire agreement is up in the air. The Board of Directors for United Medical Center, a nonprofit community hospital run by the District that is located on Southern Avenue in Southeast D.C., voted to approve a “site selection study” to build a new hospital east of the Anacostia River. The board planned to make a decision on the new site and begin construction in August of that year, DCist reported. After UMC’s Board of Directors completed the study to determine where the new East End facility would be located, Mayor Muriel Bowser announced that the new medical facility would be constructed on the St. Elizabeths East campus in Congress Heights, The Washington Business Journal reported. Bowser announced that the East End facility would be managed and run by GW Hospital and the GW Medical Faculty Associates, a group made up of faculty in the School of Medicine and Health Sciences. Bowser said the new hospital is expected to open in 2023 and will house about 100 hospital beds. The District has allocated $300 million for the new hospital, and GW Hospital is expected to contribute at least $75 million for the project over the next 10 years, according to the letter of intent signed by both GW Hospital and the city. Members of the D.C. Council introduced the East End Health Equity Act of 2018, a bill that would exempt GW Hospital from the Certification of Need process – a set of regulations that requires the State Health Planning and Development Agency to determine if a project is a public need. The act includes the construction of a new 270-bed tower at GW Hospital – something the hospital asked for when it agreed to run the East End facility – and bypass the Certification of Need process to open the new hospital in 2021, two years ahead of schedule. The Foggy Bottom and West End Advisory Neighborhood Commission, a local governing group, unanimously passed a resolution opposing the act after representatives of GW Hospital and the D.C. Council presented to the group. ANC Chairman William Kennedy Smith said the bill was the “worst piece of legislative crafting” he had seen because the D.C. Council Committee on Health did not notify Jack Evans – the Council member who represents Ward 2, which includes Foggy Bottom – or notify the University before the bill was introduced. 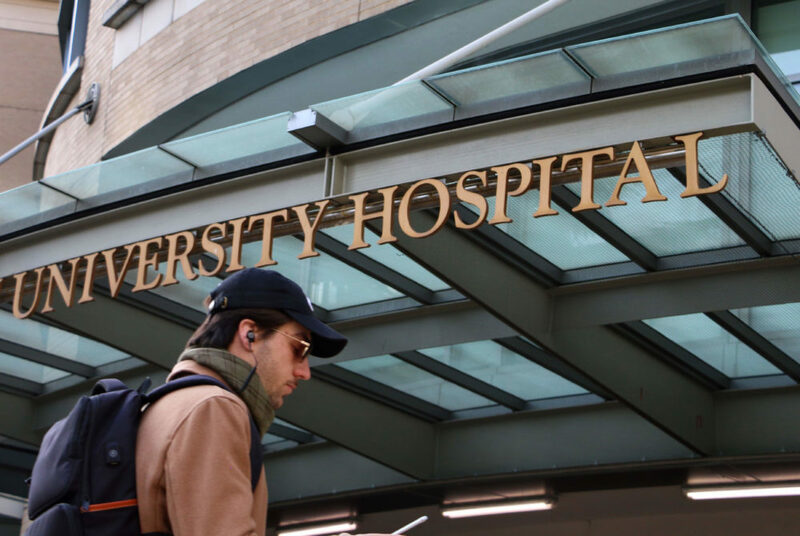 About 30 Foggy Bottom residents met with ANC members to voice their opposition to the new bed tower at GW Hospital, citing concerns that the required construction and the new facilities would increase ambulance traffic and disrupt pedestrians near the tower. Commissioner Patrick Kennedy said the project would leave GW with an “inflation-causing building in Foggy Bottom” in the future. Residents also expressed concerns that adding beds and specialized care at GW Hospital would negatively impact Howard University Hospital, which is the primary provider for care in Southeast D.C.
Howard University President Wayne A.I. Frederick told The Washington Post last month that competition from the addition of the new tower would force Howard’s hospital to shut down because patients will go to Foggy Bottom for specialized care. ANC commissioners unanimously passed a second resolution condemning the bill. The D.C. Council announced it would amend the bill by proposing a 220-bed tower instead of the 270-bed structure that was initially suggested. The extra 50 beds that were scrapped from the GW Hospital tower would be added to the East End facility. The D.C. Council passed four amendments intended to address concerns from the bill’s opponents. Two of the amendments reduced the new tower to 220 beds and prioritized the construction of the new facility in Southeast. Councilmember Elissa Silverman introduced a third amendment to protect unionized nurses and medical technicians at UMC with a bargaining agreement to ensure that employees could transfer to the new facility and receive the same labor protections they had at the previous facility. Councilmember Trayon White also proposed an amendment establishing a partnership between GW and Howard University hospitals to sustain Howard’s facility because many patients will be redirected to GW Hospital for specialized care when the new bed tower opens. Councilmember Vincent Gray called the latter two amendments a “poison pill” that endangered the success of the agreement. The D.C. Council tabled the bill for a final vote at its next meeting on Dec. 18.